As the introverted daughter of an extroverted mother, my life has been at times quite eventful. Our house was often filled with friends, relatives, and laughter. Such a childhood is a blessing for an extrovert but difficult to navigate when you prefer staying in your room with a book to making small talk about the same things over and over with uncles and aunts. Last night, my mother and I had a talk typical for us. She asked me what I was doing next Thursday, to which I replied I was busy. I asked why she was wondering about my Thursday night. My mother announced she was hosting a dinner for a foreign family which she has helped from time to time, to which I replied I was most definitely not available. I asked why my presence was required due to the fact that the family were strangers to me. They would hardly miss me at the dinner table, having never met me before. All my mother could reply was that I would no doubt like them. She forgot to take into account the fact that for me, sitting down to dinner with a set of complete strangers seems more like a nightmare than a pleasant Thursday night. Do not let the past dictate who you are or what your future will be. I spent my teens and early twenties buried in books and television shows, watching the same ones again and again. Now, I could wallow in regret at having missed social opportunities, or I could see my past as a useful step to becoming the person I am today. If I had not spent my childhood reading, for example, I would probably not have the passion I have for writing today. My writing serves as an integral part of my identity, and I would not have missed it for the world. I consider it worthwhile to have missed keggers, failed teenage relationships, and smoking joints in order to be able to inspire others with my words. 2. Know your own limits. I remember well when my family moved to Scotland when I was thirteen, and my mother, concerned for me, proposed to send me back home to Iceland for the summer. I was to live with my uncle who had a daughter the same age as me. I refused, seeing as my cousin and I are different people with little in common. Living with her would have created resentment on both sides. I recognized this even as a teen. Today, I am not afraid to tell my friends if I am too tired to meet them or do not feel like having company. My friend wanted to attend a midnight viewing of some film or another a few weeks ago. I told her in no uncertain terms that I needed sleep in order to work the next day to be fit for human interactions. In my stressful job, sleep is a necessity I cannot skip. My friend was initially pushy, but realizing I had to do this for my own sanity, she later relented. Similarly, I have come to understand myself better. I have no problem playing bingo or attending a concert with a friend, but taking an unplanned road trip or going clubbing at the last minute is not my scene. 3. Accept who you are. I remember in elementary school watching the three most popular girls in my class and wanting to be a part of their crowd. I tried, but was each time shot down. I wanted to be popular, funny, and easy to get along with. When I lived in Scotland as a teen, the other kids wore Nikes and Kappa tracksuit bottoms, a different style from the jeans and Smash sweaters I was used to from back home. Even when I wore the same things, I was still the nerd in the group. I still am in the eyes of most people. Today, I have come to accept who I am. I am not the popular, cool person who is friends with everybody like I wanted to be. I had to bury the dream of who I wanted to be and accept who I was instead. Doing this was pivotal to my happiness. I no longer wish I was going out on a Saturday night because I think everybody else is. I no longer want to be the life and soul of the party because that just isn’t me. I have come to find my love of literature, writing, and history to be interesting, not something to be ashamed of. 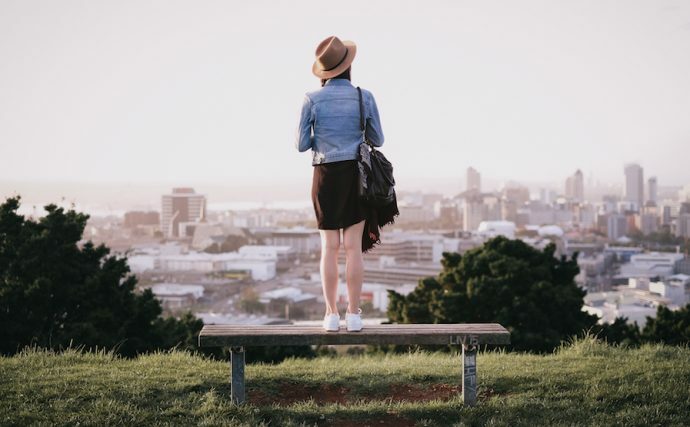 For such an introvert, I have never been afraid to explore new opportunities, such as working in a famous tourist spot for the summer, working abroad as an au pair, or attending a class that intrigues me. From the tourist work experience, I gained a good friend; from being an au pair, I now have a second family to love; from my writing classes, I gained inspiration. Do not reject new opportunities from fear, because they often become valuable life experiences. 5. Surround yourself with people who love and understand you. I am lucky enough to be blessed with not only the family I was born into, but a second one of my own creation. These are people who do not share my blood but spirit. There is my best friend from high school who I can be nerdy with and discuss Supernatural and Criminal Minds ad nauseam. There is my friend I made during my university studies who shares my passion for history. Then there is the friend of my grandmother who has adopted me and is basically now another grandmother to me. All these people contribute to my personality and my development. They see me for who I am and accept me. Surround yourself with light and love. Jane Lancaster is a born introvert who loves to write fiction and read history. She loves to travel and has accumulated life experience from various jobs that include packing carrots to teaching. Jane has come to find her own introversion fascinating and loves to study the subject.